Reawaken your yoga practice, unleash your creative expression and journey through New Zealand’s South Island in WellBeing #177. 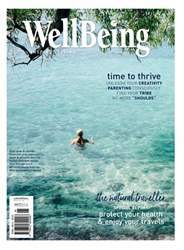 Reawaken your yoga practice, unleash your creative expression and find your soulful tribe in WellBeing #177. Protect your health and journey through destinations near, such as New Zealand’s South Island, and far, like Kalimantan in Borneo. Slow down and nourish with brassicas, brahmi, dandelion and leafy greens. Be inspired by quick and effective exercise, holistic bedroom design and the healing power of touch. Consciously parent your teens, free yourself from “shoulds” and harness the power of the placebo effect. Explore greening the Jordanian desert and discover the transformative power of a weekend at Golden Door Elysia. Treat your skin with honey, learn how to recreate a day-spa feeling at home and prepare for your most soothing spring yet. See how Deborra-lee Furness is helping to care for children the world over, plus our regular columns and much, much more!